We are now walking southwards along the left-hand side of South Street (the west side), leaving behind the Nag’s Head, and on towards West Street, previously named Wide Yard. This was 49 South Street in 1871. Robert and Louisa Clarke came from the agricultural district between Nottingham and Newark to settle for a time in Ilkeston in the 1860’s. Grocer John Smith lived many years in South Street and when his first wife Mary died in June 1846 he took in a ‘housekeeper’ Sarah Robinson, the daughter of Awsworth coalminer Solomon and Sarah (nee Chambers). In August 1857 the two were married and continued to live in that street. John died there in July 1868, aged 73. Gap alert! Who were the Harrison in this part of South Street? Mr. Rowley, a gardener, Mrs. Rowley was a laundress….. 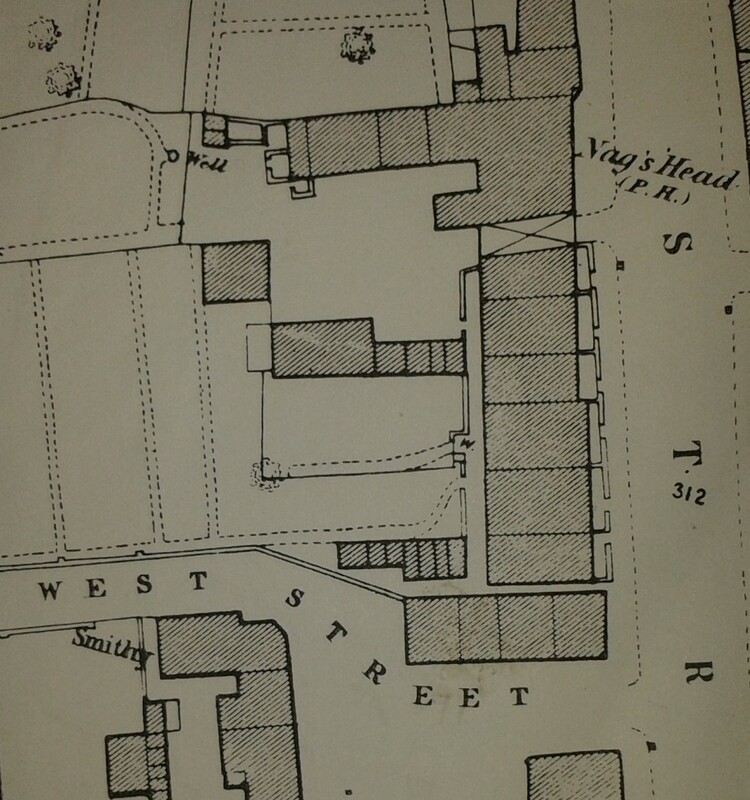 This was 46 South Street in 1871. Like neighbour John Smith, William Rowley was a long-term resident of the road. The gardener and greengrocer came to Ilkeston in the late 1840’s with his wife, Eastwood-born Ann Goodere Rowley (nee Fletcher), daughter of William Fletcher and Ann (nee Savage), and their three children — Jane, Sarah and William. One Monday at the end of April 1852, daughter Sarah, then aged 11, felt very ill and was put to bed. She died the following day. Dr Norman conducted a postmortem but could find no reason for her sudden death. A verdict of ‘died from natural causes’ was thus recorded at the inquest. If this was 45 South Street in 1871, then the census shows fruiterer/green grocer Francis Daykin, originally of Belper, as the tenant, with his wife Sarah (nee Harrison) and son Isaac. He seems to have arrived in the street about 1870 and left shortly after the census to work as a coalminer in Handsworth. Son Henry was born in South Street in February 1871. This was 44 South Street. Martha Cartwright, born in 1823, was the eldest child of journeyman* miller Richard and Catherine (nee Swanwick) and older sister of John Cartwright. She was living in South Street with her parents and working as a straw bonnet maker when she married West Hallam- born engine worker William Gregory in April 1853, and continued in the same occupation in the same street for some years after. *a journeyman was a worker who had completed his apprenticeship but was not yet a ‘master craftsman’. The name has not a lot to do with travelling but comes from the French word journée meaning day — the journeyman being paid by the day for his work. Two of the cottages have been converted into shops. And then, Wide Yard and/or West Street.